Gymnastics-inspired Exercises . 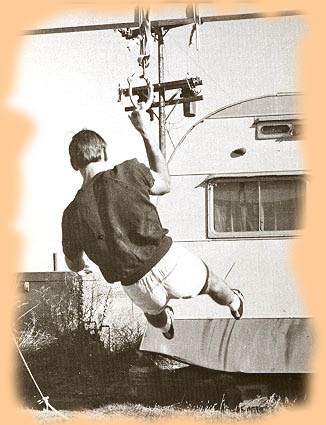 . .
By 1958 I had learned a variety of climbing-related muscle feats, four of which can be seen below: One-arm (front) levers , One-finger pull-ups (on a metal ring 3/4" to 1" diameter) , One-arm pull-ups with weights (20+ pounds) , and One-arm pull-ups on a 1/2" ledge . 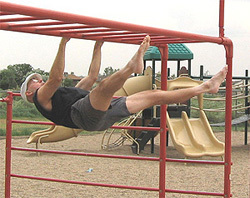 Plus a One-arm Lever Pull-up. 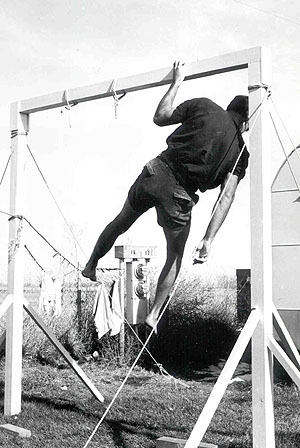 Photos below taken about 1969 in Ft. Collins, CO.
One finger pull-ups are related to the old Austrian & Bavarian tavern game of Fingerhakeln, and probably go back to the 18th or 19th century. Lillian Leitzel, a tiny Polish-born circus performer, is said to have done 27 one-arm chins at one time - but it's almost certain she did these dynamically, like her ring routine in which she flipped her body about on one arm. An Eastern European female gymnast about her size later did 6 proper one-arm chins - a more convincing record. 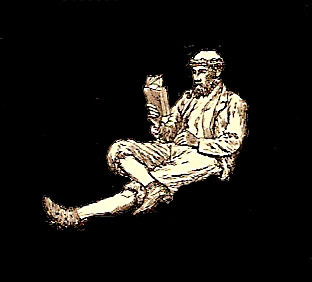 "Thanks, John . . . I appreciate seeing that!" 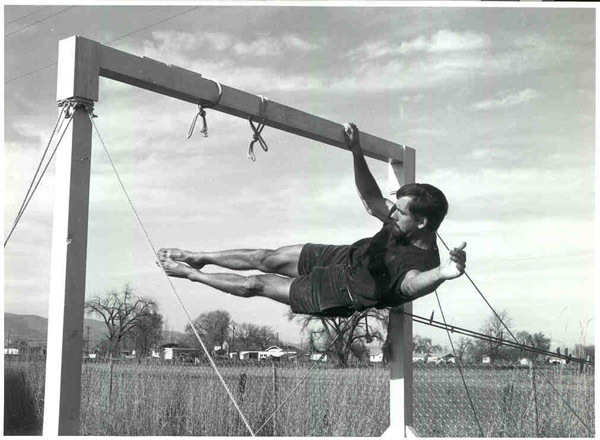 - Jim McCarthy, Tetons 1964, commenting on my one-arm front lever. The old man is still at it . 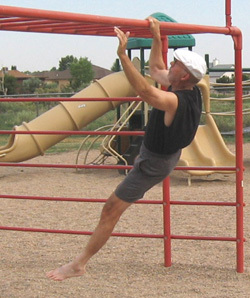 . . at the playground in July, 2007, at age 70. Arthritic & much subdued from 40 years ago! 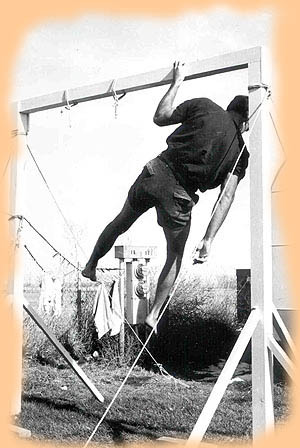 Rope Climbing : The 20 foot climb of the 1.5" diameter, natural fiber rope begins from a seated position on the floor, legs extended and straight, straddling the remainder of the rope. The initial pull from the floor is absolutely critical in generating momentum for the remainder of the climb. I would practice the start by doing 10 consecutive muscle-ups on the high bar, plus several reverse-grip muscle-ups. This is where I developed a lot of my dynamical strength for climbing. The world's record for the 20' climb - established by Don Perry in 1954 - was 2.8 seconds, but in the Southeast most times were over 4.0 seconds. I was determined to break through that barrier. A couple of years later I did with a time of 3.4 seconds. But - to the best of my knowledge - I never broke the formidable 3 second barrier. Still Rings : The moves that I was determined to do - and I eventually did - were these: cross, L-cross, olympic cross, Azaryan, inverted cross, shoot to handstand, back uprise to handstand, front lever, back lever, giant swings, slow pull from straight hang through inverted hang up to handstand (mount), cross mount, butterfly mount (pull from straight hang into L-cross then to support) - eventually, I could do two of these in a row. 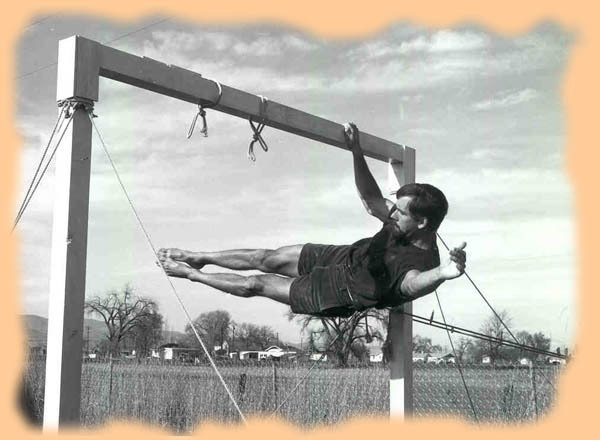 But my Planche and Maltese Cross were pathetic, and a lack of flexibility hindered me at times. Although I conjectured it years before it was finally done, I was never able to hold what became known as a Victorian Cross - a front lever at the level of the rings - although I could pull into it at times.